Brushing and flossing are daily ways to keep your teeth bright, white and in good health. Still, if you might believe your smile is lacking some shimmer or is more yellow than it used to be, you’re not alone. When the American Academy of Cosmetic Dentistry asked people what they ‘d most like to enhance about their smile, the most common reply was whiter teeth. The American Association of Orthodontists also found that nearly 90% of patients asked for tooth whitening. Thinking of teeth whitening? Get the facts first. Here are five of the most commonly asked questions about the procedure. Why Did My Teeth Change Color? Coffee, tea and red wine are some major staining offenders. What do they share? Strong color pigments called chromogens that attach to the white, outer area of your tooth (enamel). Two chemicals found in tobacco create stubborn stains: Tar and nicotine. Tar is naturally dark. Nicotine is colorless until it’s mixed with oxygen. Then, it turns into a yellowish, surface-staining substance. Below the hard, white outer shell of your teeth (enamel) is a softer area called dentin. In time, the outer enamel layer gets more delicate with brushing and more of the yellowish dentin shows through. If you’ve been hit in the mouth, your tooth may change color because it reacts to an injury by providing more dentin, which is a darker layer under the enamel. Tooth darkening can be a side effect of certain antihistamines, antipsychotics and high blood pressure medications. Children who are exposed to antibiotics like tetracycline and doxycycline when their teeth are developing (either in the womb or as a baby) may have discoloration of their adult teeth later in life. Chemotherapy and head and neck radiation can also dim teeth. Teeth whitening is a simple process. Whitening products contain one of two tooth bleaches (hydrogen peroxide or carbamide peroxide). 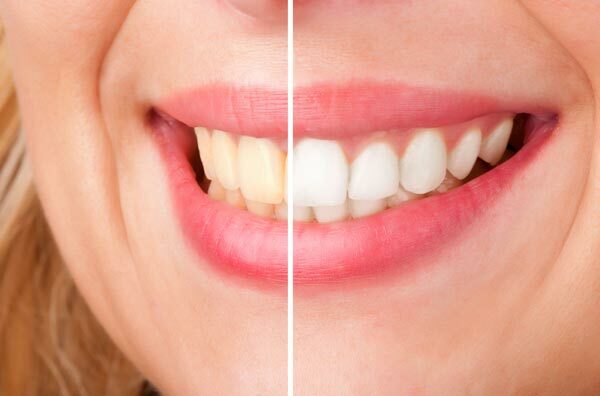 These bleaches break stains into smaller pieces, which makes the color less concentrated and your teeth more vibrant. No, which is why it is necessary to talk to your dentist before deciding to whiten your teeth, as whiteners may not correct all kinds of discoloration. For example, yellow teeth will probably bleach well, brown teeth may not respond as well and teeth with gray hues may not bleach whatsoever. Whitening will not work on caps, veneers, crowns or fillings. It also won’t be practical if your tooth discoloration is brought on by medications or a tooth injury. All toothpastes help clear away surface stain through the action of mild abrasives that scrub the teeth. Search for whitening toothpastes that have earned the ADA Seal of Acceptance for stain removal (it will tell you on the package). These toothpastes have added polishing agents that are healthy for your teeth and provide stain removal success. Unlike bleaches, these forms of ADA-Accepted products do not alter the color of teeth because they can only remove stains on the surface. This procedure is called chairside bleaching and normally requires a single office visit. The dentist will apply either a protective gel to your gums or a rubber cover to protect your gums. Bleach is then applied to the teeth. Your dentist can possibly provide you with a personalized tray for at-home whitening. In this case, the dentist will give you instructions on how to place the bleaching solution in the tray and for what period of time. This may be a preferred option if you feel more comfortable whitening in your own home at a slower pace, but still with the guidance of a dentist. Out-of-office bleaching can take anywhere from a few days to a few weeks. You may see different options online or in your local supermarket, such as toothpastes or strips that whiten by bleaching your teeth. The concentration of the bleaching agent in these products is below what your dentist would use in the office. If you are contemplating using an otc bleaching kit, discuss options with your dentist and search for one with the ADA Seal of Acceptance. That denotes it has been tested to be harmless and effective for teeth whitening. Get a list of all ADA-Accepted at-home bleaching products. Are There Any Adverse Effects from Teeth Whitening? Some people who use teeth whiteners may experience tooth tenderness. That happens when the peroxide in the whitener penetrates the enamel to the soft layer of dentin and irritates the nerve of your tooth. In most cases the sensitivity is temporary. You can delay treatment, then try again. Too much use of whiteners can also damage the tooth enamel or gums, so be sure to follow directions and speak to your dentist.